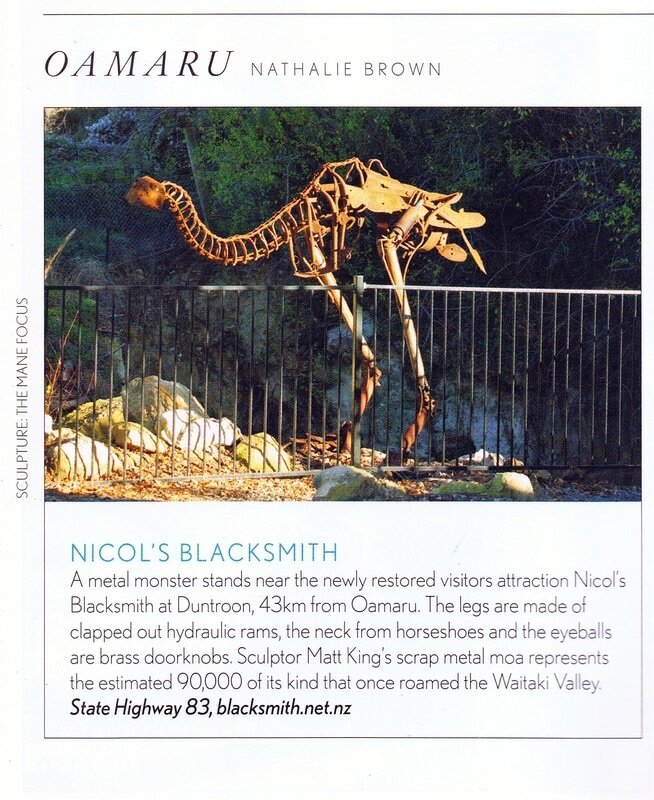 The Brewery Hole, Duntroon - Nicol's Blacksmith ShopDUNTROON N.Z. The Brewery Hole is a sunken limestone cavern created by an underground stream. It was known in Maori times and the water hole was seen as a source of pure, clean water. "Waikoakoa" translates as ' happy waters'. There is a ‘story’ that the reflective surface of the water hole was used as a mirror by ‘wahine’ – young Maori women. The Blacksmith drew water from the hole. 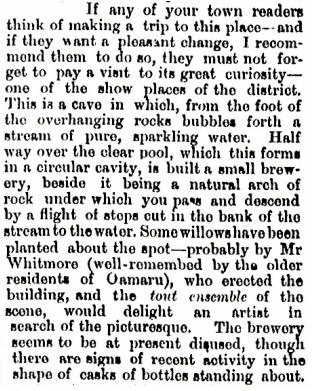 An extract from a 24/9/1877 article from the North Otago Times is shown on the right. It refers to a “great curiosity” in Duntroon and describes the Brewery Hole in some detail and refers to a “small brewery” which seemed to be disused. ​A photograph taken in 2014 prior to making it more accessible. ​In recent years the town water supply was changed and water is now drawn from the river. Since then the area became very overgrown with trees, shrubs, vines etc. Nicol’s Blacksmith Historic Trust owns the land with the Brewery Hole and Blacksmith Shop on it. When planning the restoration of the blacksmith building it was clear that tidying up the Brewery Hole and opening it to visitors would be another interesting visitor attraction. ​Divers have been able to “squeeze” their way along some of the underwater channel and have made a short video of what they saw. It is hoped that one day we can show visitors this video as well as perhaps install a “live underwater camera” to enable people to see what is down there in real time.